Immersive Technologies’ Equipment Simulators are supported by the industry’s most comprehensive range of compatible tools, technologies and professional services. This ensures a solution to meet or exceed your needs can be defined, delivered, implemented and generating operational results quickly and with very low risk. The PRO4 has been optimized for surface mining. With full HD resolution and a large integrated rear screen, the PRO4 is the most advanced simulator platform on the market. The IM360-B has been designed for underground hard rock and underground soft rock mining—and supports both underground and surface simulator modules. This platform offers a combination of configurability and simulation realism. The LX6 is a medium fidelity simulator platform which is perfect for machine and site familiarization, emergency response and compliance training. The LX6 is compatible with all surface machines simulated by Immersive Technologies and shares the underlying technology of the industry leading PRO4 and IM360-B. The LX3 is compatible with the wide range of machines simulated by Immersive Technologies and shares the underlying technology of the industry leading PRO4 and IM360-B. Conversion Kits® are Immersive Technologies' interchangeable equipment modules that fit onto base simulator platforms allowing a range of different equipment to be simulated. 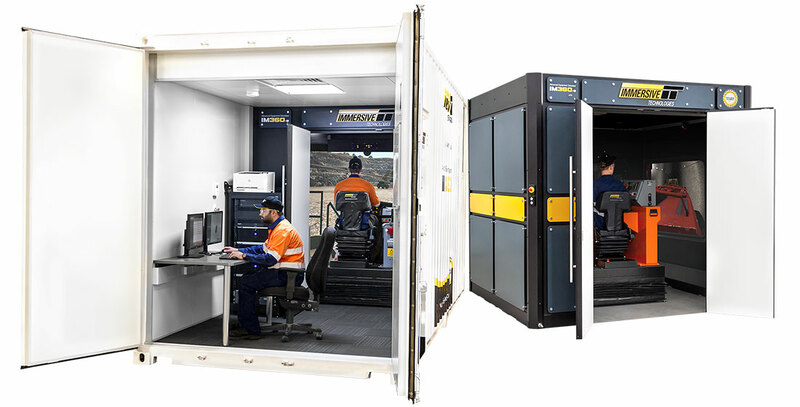 Immersive Technologies’ Conversion Kits® provide the ultimate in simulator training realism for mines focused on increasing operator safety, improving productivity and reducing levels of unscheduled maintenance. Maintain complete visibility over your local or global simulation training activities via a secure website. A highly realistic 3D representation of your actual mining operation that works in combination with our Equipment Simulators. A Custom Mine Site will allow your operators to obtain site familiarity within a safe, controlled environment. Correct site procedures/operations can be practiced with minimal risk to lost time in production and maintenance. SimMentor™ is a valuable training tool that provides three key training features: Briefing, Debriefing and Live Session Display available via a large touch screen monitor situated outside the simulator. TrainerAdvantage™ allows mines using the Advanced Equipment (AE) Simulators to gain the maximum benefit and return on investment from their purchase. Trainer Productivity Station is a centralized workstation that can connect up to five Advanced Equipment Simulators. This allows a single trainer to manage up to five simulation training sessions simultaneously. Flexible packages delivering system availability, mitigation of implementation risks and real operational results. Simulation based operator training has been successfully applied to a range of diverse industries where high risk and high costs are everyday issues requiring smart solutions. Whether piloting a plane or launching a space shuttle, simulation training has been proven to dramatically reduce risk, cost, unscheduled maintenance, increase trainer effectiveness and efficiency while maximizing productivity. Within the often hazardous mining industry, simulation training has quickly gained recognition as a significant method of increasing site safety and profitability through improved operator skill and knowledge. Simulators provide operators a safe environment to learn and practice their skills. Immersive Technologies’ simulators allow the operator to practice for a range of possible emergency situations. Many of these situations are too dangerous, too difficult or too expensive to test in an actual mine. Operators can also be shown and assessed for the proper operating technique much more quickly and accurately than the traditional in machine approach. Focus on improving operator technique with Immersive Technologies’ simulators has delivered proven results including longer tire life, reduced spot time, reduced brake abuse, improvements in fuel use, reduction in engine overspeeds and more. Simulator training allows operators to be shown and assessed without the need to borrow machines from production. This allows new operators to practice many skills before being placed into a production circuit. Because operators are consistently shown and assessed on the proper operator techniques they have a better understanding and knowledge of the real machine. Following Immersive Technologies release of the world’s first mining dump truck simulator in 1998, their customer results, support network, machine range, global mining footprint, level of realism and OEM endorsements are without equal in the industry. Highlighting the benefits of simulation training, four leading Original Equipment Manufacturers, Caterpillar, Hitachi, Komatsu and Liebherr have chosen to exclusively sign technical information licensing agreements with Immersive Technologies, providing access to proprietary technical information necessary to accurately replicate the operation of their mining equipment. As the world’s largest supplier of mining equipment simulators, Immersive Technologies’ has a customer base that includes many of the world’s leading mining operations, mining contractors, training schools and original equipment manufacturers. Widely recognized as the global industry standard, Immersive Technologies’ has extensive experience in delivering complete training solutions to the mining industry with measurable safety and business improvement outcomes. Immersive Technologies has worked closely with thousands of mining training professionals, managers, and executives to deliver comprehensive solutions that have been proven to improve safety and mine profitability.